Deryn, thanks so much for preparing this info. Perhaps I’ll finally be able to understand the relationship between major and minor keys. My pleasure Laura! I’ll be discussing minor scales, keys and their relationship to major keys in my next post – I hope it helps! Dear Deryn, thanks again. I’m probably the rare type of music student, who understands math better than music. However, this also drives me crazy sometimes, because from a mathematical point of view many things seems unecessarily and artificially overcomplicated, and when You ask a musician why is that so, the answer is not really satisfying from a “scientific” point of view in many cases. Like C major and A minor “feels differently”, and things like that. Anyway, I’m patient and respectful towards music, so I’m hoping to see the whole picture someday, and then give the “mathematical” answer to my old questions. Recently I’ve found a nice article about the physics of the whole stuff, and now I can understand why a semitone is the 12th root of 2, and this partially answeres lot of my earlier questions. After this long introduction: the similar way, I can understand that F# and Gb are not really the same always. But in this particular case, if I’d “transpose” a piece written in Gb major to F# major, and give to You the same music sheet but with 5 sharps instead of 5 flats, would You play it differently? And if yes, could You explain it in a few words, what the difference would be? Also if these two sounds different, it would make me want to go even further, more specifically to G# major with 6 sharps, and one double sharp on F. And continue that until E# major and then we get back to C (or probably it is Bx not C, but that’s too much even for me for tonight, so let it be C for now :-D). So, regarding this major scales with double (or triple, etc…) sharps (or flats in the other direction) my question is: do such “fanciful” compositions exist for the cello? With equal temperament, the tuning system in wide use today and used for tuning pianos, there would be no difference in sound between enharmonic equivalents (i.e. Gb Major versus F# major) because the twelve notes in the octave are separated by logarithmically equal distances (100 cents). However, in tuning systems based on the Pythagorean system including meantone temperament, well temperament, and Syntonic temperament, enharmonic notes differ slightly in pitch. Elements of meantone tuning can and often are still exploited by players of intonating instruments – i.e. strings, winds, brass, etc – to bring more expression and colour into a performance. This is often referred to as expressive intonation, and presents itself as a slightly sharper leading note and mediant to enhance the qualities of a major key, or a slightly flatter mediant and slightly sharper leading note in a minor key. However, we would not choose one enharmonic equivalent of a key over another for a difference in sound – it doesn’t exist. The total number of accidentals in the two equivalent key signatures always add up to twelve – the total number of semitones in an octave. Why would we choose one over another? Normally composers will opt for the key with fewer accidentals – e.g. Db major rather than C# major. There is also harmonic context to consider. For example, if the first movement of a sonata is composed in Db major and the second movement is in the subdominant key, it would be Gb major rather than F# major. 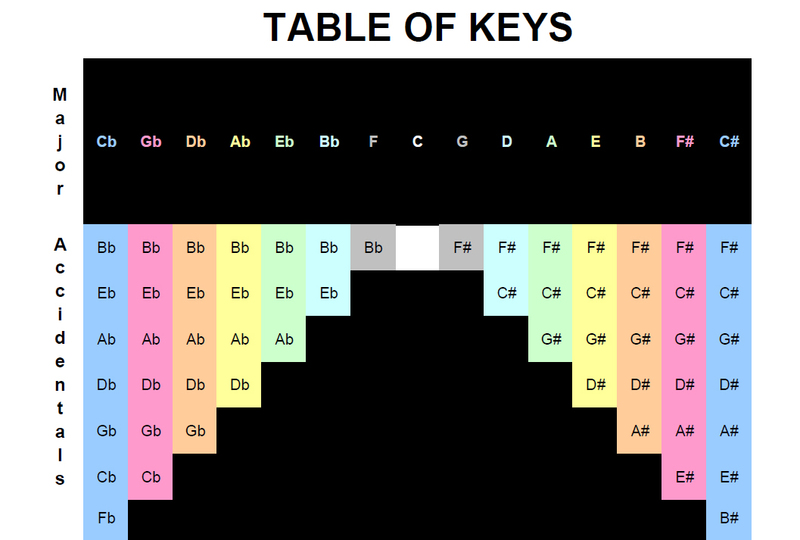 As for keys with double sharps or flats, they exist in theory but not in practice. Although double sharps or flats may appear as non-harmonic notes within a score – e.g. if I raise the dominant in F# major I would spell it as Cx, not D. But key signatures with double sharps or flats are messy and unnecessary when they have perfectly logical equivalents. Dear Deryn, thanks for the exhaustive answer. After reading all those stuffs on wikipedia, I was also ending up with a conclusion something like this, but You wrote the things down in a very coherent and understandable way. Many thanks!